I woke up on a mountain. No, scratch that, a bunk bed, but close enough. The mountains visible out the window of the hut were my Siren song of the day, except I wasn’t resisting them and following them only led to the bad conclusion of falling further in love with them. I felt myself pulling towards them, I could hardly think about breakfast, I had climbing to do. 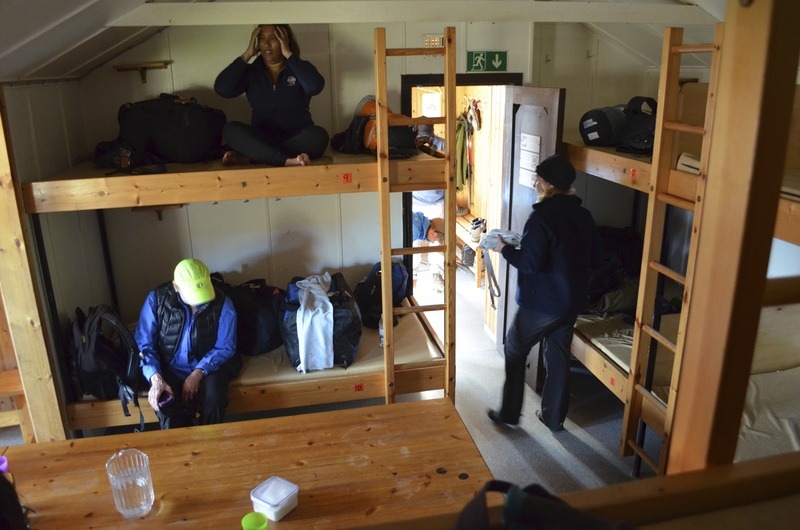 I was unlike the rest of the group, who couldn’t resist the slow process of waking up in the morning: the creaking of feet ascending the ladders from the top bunks, laces to boots to socks to feet. Jackets? Check. Trekking Poles? Check. 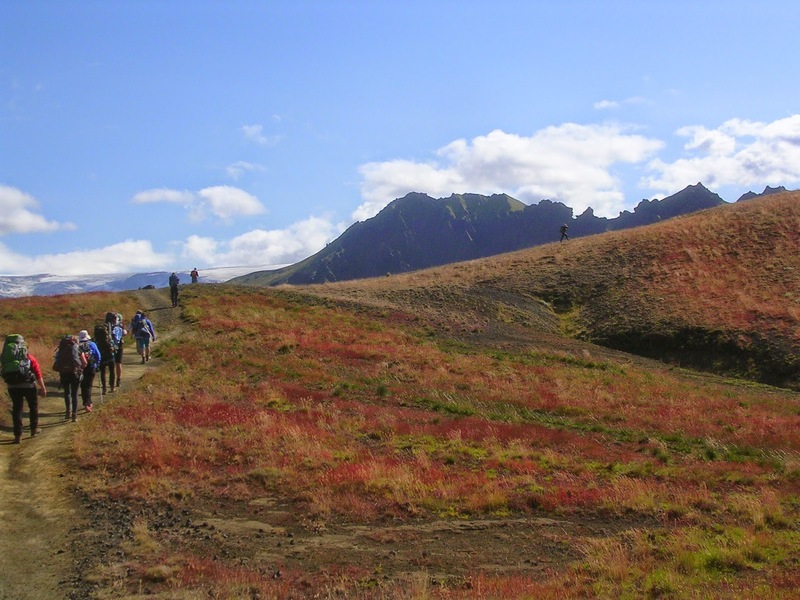 Today, the fourth of our six day trip through Iceland’s famous Laugavegur trail, was the last trek for a little less than half of the group, since some opted only to do the four day trek from Landmannalaugar to Þórsmörk. It was also the last day for one of our guides Nonni, who had been taking our gear and food from hut to hut every day. Our numbers were dwindling, but we were persisting. The hut they would be dropped off at was a little out of our way, but in it was the promise of a nice can of beer and a rest. Shoelaces were immediately tied and the herd had rounded itself up in the hopes of a rewarded hike. 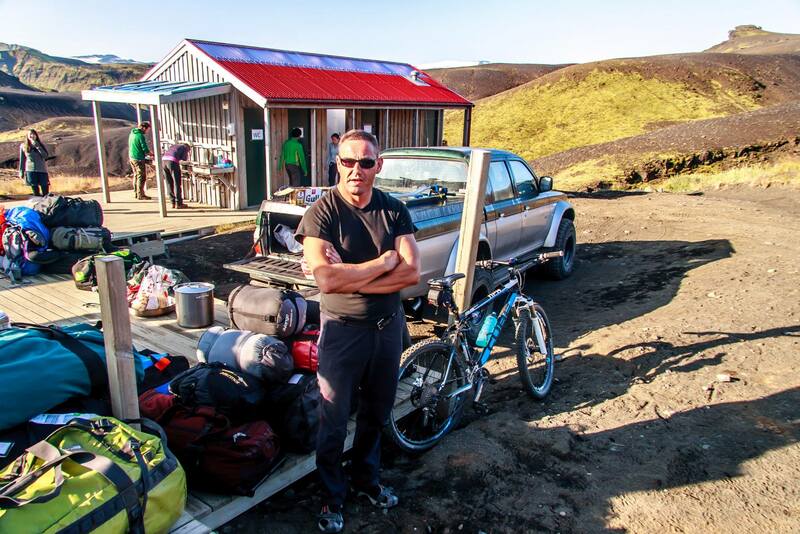 The hike of the day was a rough 20km from the hut Emstrur to the hut Húsadalur, and then to the hut in Þórsmörk where we would be staying for the next two nights. 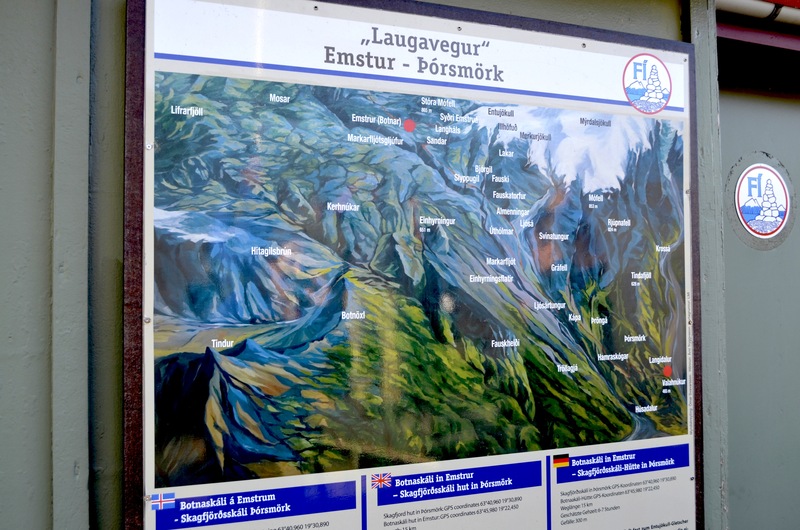 According to the map the route seemed deceptively downhill, and a rare Icelandic forest awaited us (Þórsmörk does mean “Thor’s forest,” after all). With green tents contributing to the moss behind us, we set forth across a fresh landscape. The trek today was much of what it had been before, but the freshly-lit awe of our surroundings ceased to fade. The sky was so deeply blue that it set the a mountains ablaze in a thinly colored haze. In much of Icelandic art, both past and present, the mountains were and are depicted as giant blue-violet spectacles. It was claimed that yes, the mountains were indeed made of blues and violets despite their true brown/black coloring. Even if the cool colors were illusory based on distance in time and space, the reality depicted by the artist was the one that their eyes spoke of in those exact moments, and this was what they painted. So a hazy blue the mountains were, cloaked in atmosphere, reflecting the aura of the celestial gods. 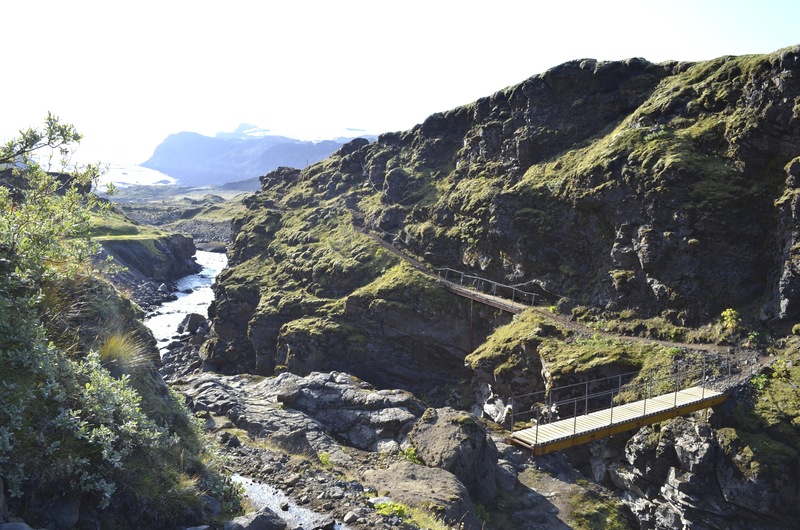 With the the glacier Mýrdalsjökull growing slowly nearer in the distance, we came to a bridge crossing. Obviously no makeshift path, the bridge extended sturdily across the shallow yawning chasm of the river. I’ve found through many bridge crossing in Iceland that there is a particular, reoccurring feeling that arrives while standing on each bridge. I see the water below me, a parade of liquid silk bubbling and lapping onto the waves of itself. I stand on the platform in a direction against the current and feel as if I am being pulled by it, as if I am pushing against the direction of the wind with my entire body. But the thing is I’m not really being pulled by anything, but my mind thinks otherwise. It is begging me to accept a reality where the water is able to physically move me while i stand on this bridge. I enjoyed this reality, and I stood on the shaky, suspended walkway for awhile. Within me had grown this inkling to escape from the group, I had this desire to communicate with the earth again, privately, alone. 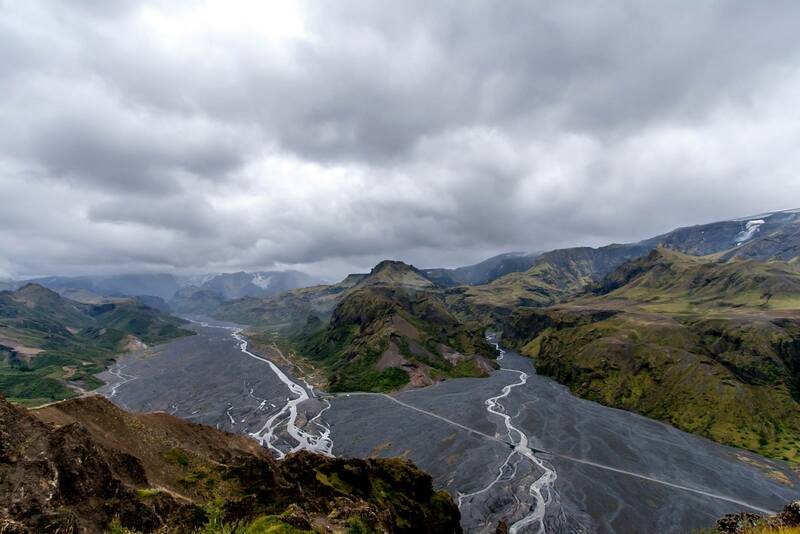 I unweaved my headphones from my daypack and began Sigur Rós’s Valtari, an album that had been following me throughout the landscape, quietly playing in the far recesses of my memory, stringing its way along the curves of each passing peak. Our group took a break on top of a high rock face overlooking a river carved deep into the mountains. I walked a distance away and sat on the edge. I crossed my legs and put my hands up in the air like a bird, I had transparent wings, they felt no wind, I was still, stationary. I was free. I listened to Varðeldur (“campfire” in English) and trailed my eyes along the lines of the canyon the wind and water had eaten away. They seemed to dip and rise like the steady flow of the rhythm, I could feel the piano welling up in my chest and my lungs were tightening. I realized I was crying. My tears fell down my cheeks as if gravity was happily pushing them towards and into the river beneath me. I laid down on my stomach over the cliff face and cried, I let the music dictate how aggressively they fell. They were the slowest, smallest waterfall in all the land. I felt part of myself integrating into the earth. I was shedding tears that the sky lacked, I was giving the earth something that it had missed in those last three days. I felt like I had belonged to a process, like I had as much to say to the earth as the rain did. Perhaps not as noticeably, perhaps with less impact, but I still had something to say and I said it. 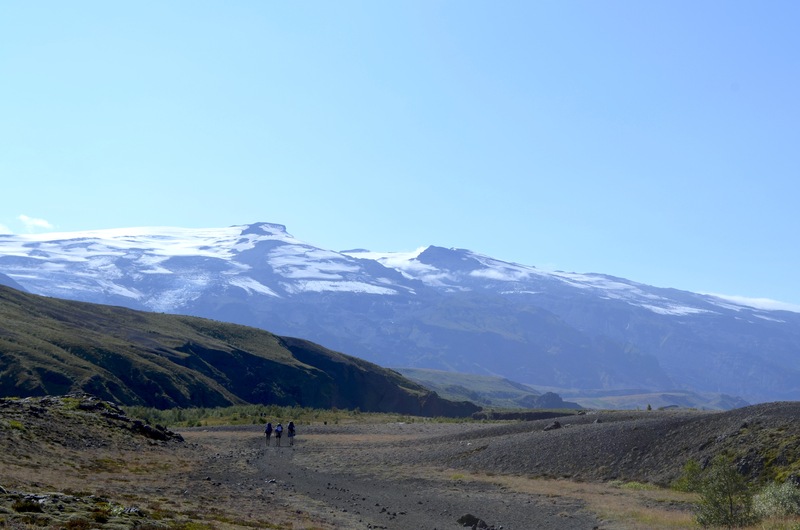 Thoughts of having to leave Iceland welled up within me: In my head I could simulate the feeling of having to walk away from the mountains, from the island, from home. Each step forward on the trail was another step away from Iceland. I was leaving the day after the trek and the moment was yearning closer and closer to me. It was amazing and I was astounded to think that each step closer to home was also a step through something beautiful. I was thinking that perhaps the pain of leaving was going to be a beautiful ache; perhaps the pain of leaving was going to acknowledge that I was here, begin impacted by something so beautiful that it just had to bring pain. Something was happening here, I was falling deeply in love with something, the mountains, the essences of them, the earth. The time had come to leave our rest stop, and so we continued on further towards the black sands. What began as a rhythm of Sigur Rós transitioned into a melody of piano and violin from the Icelandic composer Ólafur Arnalds. The album “Living Room Songs” made its way into my ears as the rolling landscape harmonized with the instrumentals of “Tomorrow’s Song.” I was walking alongside Peggy, mountaineering extraordinaire, and she noticed that I was tearing up. She had asked me what was wrong, and all I could do was open my arms out to the landscape and say “this is all so beautiful, I don’t want to have to leave this place” through tears. She immediately embraced me and held me for a moment. I felt like she was holding me in the same way that she held her own daughter; She understood, I felt that her and I were experiencing beauty on similar levels. She had this sensibility about human beings, she was delicate and soft towards other’s emotions. I was very thankful for this moment, and when it was over I walked along with Ólafur playing against a vibrant sky. 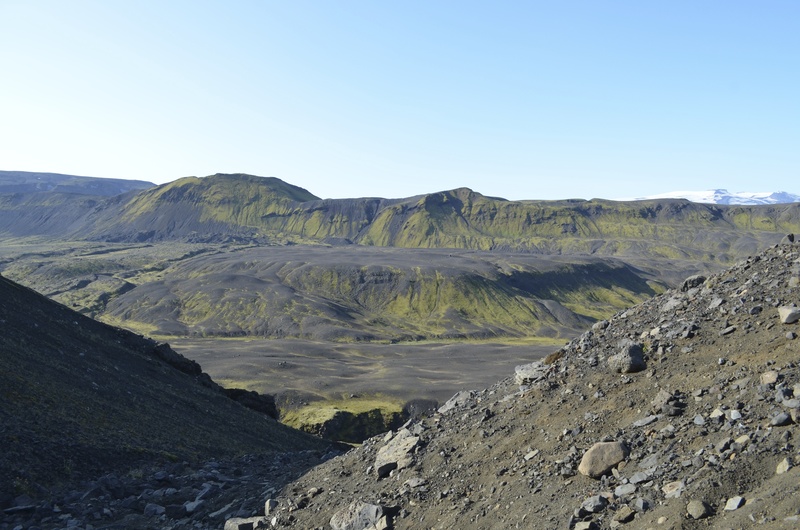 I knew we were approaching closer and closer to Þórsmörk because the vegetation started to appear. A previously naked earth gave way to speckles of plant life, flowers, trees in the distance. The giant glacier Mýrdalsjökull intimidatingly rose above all in a blue haze of itself. The streaks of white snow and ice were the only substance resembling clouds that we had left in the sky that afternoon. Over the course of my stay in Iceland, I’ve come to the conclusion that Iceland is one of those places that doesn’t call for over saturation when photos of itself are edited. You can snap a brilliant photo of the mountains and not have to edit a singles aspect of it, it lies perfectly in a flame of color. In fact, I think if any editing must be done, the saturation has to be lowered. I guess Iceland is one of those countries that just likes to show off. It has a nice photogenic ego, it bathes in the camera lens without any intentionality. Before we could enter the forest, an immense hike was demanded of us. Plants taunted us from the sidelines, growing more and more in concentration the closer we got, but the trail also became steeper and more strenuous. Our eyes, being accustomed to staring in awe at the glacier, had to change gears and focus on the ground as rocks tried to divert our path. Single file we zigzagged up one of the steepest climbs on the trail, each step bringing us higher and higher, bringing us closer and closer to the elevation of the glacier. Bright red grasses greeted us halfway up and as the incline receded, fields of flowing maroon shone in broad daylight. I was brought back to my college Psychology class and a discussion on the Young-Helmholtz theory, which theorizes that are three photoreceptors (cones) in the eyes that corresponded to the colors red, green, and blue. Red grassed, green vegetation, bright blue skies and deep blue mountains. Everything felt so vibrant and complex, with an underlying simplicity that spoke volumes. After we approached the top, we realized in a matter of moments that we had to descend right back down on the other side, straight into the final river crossing of the trip. As mentioned in previous posts, I’ve found that descending sharp inclines is much more difficult than the ascension. You have to use different muscles and your knees are more apt on giving out from underneath you the further and faster you descend. You slide much more easily, and often you’re sent tripping right into the person who is also tripping in front of you. Luckily there were no games of dominos down the sides of the mountains, but there were plenty of messy falls and yelps from uncoordinated hikers above and below me. This didn’t last long, and before we knew it we had approached the river crossing. Our gateway into the forest. One thing I haven’t mentioned largely on the trail are the river crossings that seem to want to throw us off course. These are perhaps the most inconvenient attributes to the hikes, but if you’re falling asleep or exhausted, they’ll be sure to wake you up. After a few crossings, you get the hang of things: take off your backpack, roll up your waterproof pants (yes, even those), roll up your long underwear, take off your shoes, your socks, your sock liners, tie your laces and wrap your shoes around your neck or attach them to the bag. Put on your water shoes and your bag but don’t clip anything the straps together (if you fall in or downstream, your heavy bag better not be coming with you). Then the fun begins. 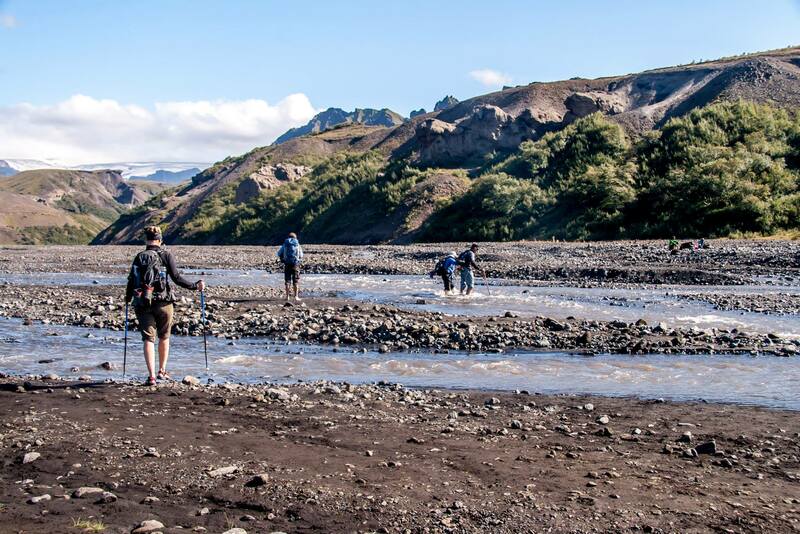 Our last crossing turned out the be the longest and deepest crossing, since this river was coming straight out of the glacier Mýrdalsjökull. Before you step in, the anticipation vaguely terrifies you: you know it’ll be mind-numbingly cold. You can hear the sharp intakes of breath by your trek mates as their feet plunge into the water. You watch them scout out the shallowest parts of the river, some failing as they end up splashing their feet in above their knees. You can tell whose feet are probably shaking and whose toes are braving the water like champs. You take that first step in and your body flickers off and then on again from the shock of the cold. Even thought it isn’t that cold, it’s still really damn cold. You feel the magnetism of the current pulling you off course, but you perservere. If you’re lucky, you’ll have trekking poles to seek out the shallowest ends. If you’re unlucky, you’ll have spent 10 minutes in the same freezing spot contemplating how in the world you’re going to do this without getting water up past your ankles. This is unnecessary thinking because it’s too late and half your legs are already submerged. Silly you, you expect too much out of this river. When you do get across though, you can poke fun at the people who came out much wetter than you. That is, until you put your shoes on your bag and realize they’re going to be dripping all over you for the next hour. Needless to say, the river crossings are both amusing and awful. The cold shock of water on your feet wakes them up, and refreshes you for the rest of the walk. It’s like a nice shower for your feet, and you don’t have to pay 500 Krónur for it (showering at the huts is about a dollar/100 Krónur a minute, ouch). This was one of the first moments during the trip that I could not see the mountains. It was as if we had entered another world, something so unlike the Iceland we had gotten to know. This was almost mystical. The sunlight speckled throughout the low trees reminded me of the fairies and sprites I had gotten to know in fairytales as a young child. The forest was also unlike any other concentration of vegetation I had ever seen in the states; it was void of all life. Not an animal, reptile, bird or insect was to be seen. The occasional swarm of small flies reminded me that not all was gone, but the eerie reserved nature of the forest was surreal and outstanding. This forest was for the trees. After the forest cleared, we finally entered the campsite/hut where the 4 day trekkers were to be dropped off, and more importantly, where there would be snacks and beer. After a few sad goodbyes, we huddled into the eating area, cracked open a few Viking Gylltur’s (Icelandic beer, “gylltur” meaning “gilded”) and handed around bags of M&M’s over conversation. Our guide, Svavar, went into depth discussing the process of herding Icelandic sheep for the winter, and we got a fulfilling lesson on how to brand sheep with the help of a few of Svavar’s novice illustrations. After a few beers it suddenly hit us that we couldn’t stay here, and we felt we’d cheated by retreating back to a bit of civilization before our hike had completed. The hut we were going to was an hour’s walk away, and nobody wanted to be drunk on the way there. Into the forest we retreated once more, eventually coming to our final hut for the duration of the next two nights. 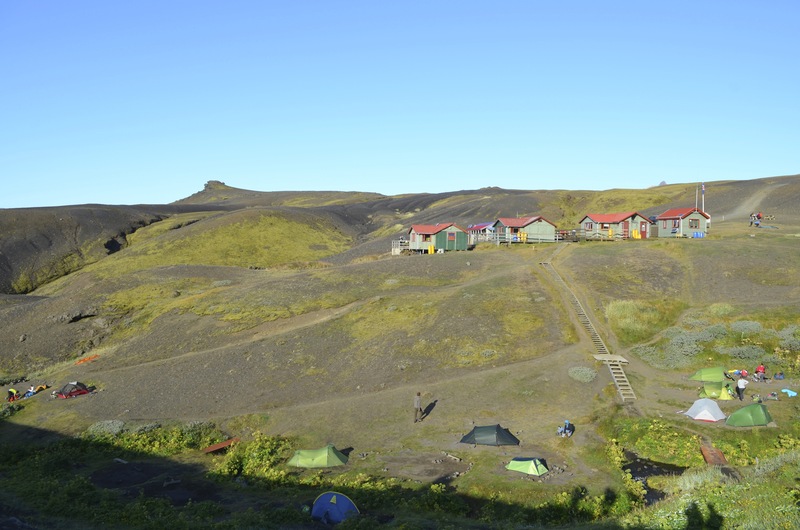 Here we were in Þórsmörk, a collection of huts hidden away in the trees near the edge of two glaciers, Mýrdalsjökull and Eyjafjallajökull, which we would be hiking between the next morning. After a long day, we had finally made it to the end checkpoint of the trail. Two days still awaited us, and even before that was the surprise of a lovely campfire at the hut that night. A group of Icelanders was there to celebrate the birthday of their friend, and all of the trail-goers were invited to the giant bonfire. Since it was nearing the end of August, the midnight sun was nowhere to be seen and it was black by midnight. We sought our way through the forest and out to the fire, following the voices of Icelanders as they gathered around with guitars and loud, passionate singing. I jumped at the opportunity of having a beer and chatting with Icelanders, in Icelandic of course. I’ve found that a few beers always makes speaking another language easier. You lose all inhibitions and the anxiety of not speaking well fades. I’ve realized that I’m much better at Icelandic when I’m drinking, and my true breadth of knowledge on the language shows. I ended up chatting with another mounta in guide who was incredibly intrigued by my interest in his native tongue, and was more or less quizzed with question after question about where I was from, why I was learning, how I felt about the trail, etc. An Icelandic song I vaguely knew was echoing throughout the group, and I sang along as best I could as Icelanders acknowledged my attempt and joined in with me by cheering me with their beer cans to mine. I felt for a moment that I belonged in some way, that I was appreciated because I made an effort to understand a culture that these people held so dearly onto. Of course, that isn’t to say I wasn’t entirely incomprehensible in my Icelandic at some instances, but I tried. And I think that moment was a good way to start ending my trip in Iceland. I came there to study Icelandic and I learned more than just the language. I learned how to communicate, I learned how to reach out to people in another culture, how to understand others and the medium upon which they express themselves. In ways I became part of the culture, in every way I fell in love with it. I felt like I was finding the things which made me happiest. I felt at home for a moment. All these mountains gave me a home. 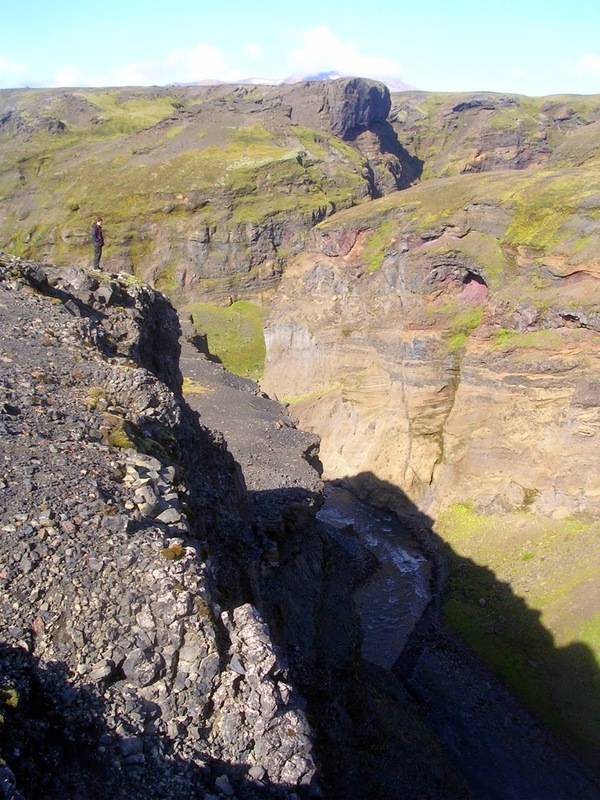 This entry was posted in Laugavegurinn Trail and tagged Þórsmörk, Eyjafjallajökull, Hiking, Laugavegur Trail, Mýrdalsjökull, mountains, Sigur Rós, South Iceland. Bookmark the permalink.